They never knew it would lead them here. 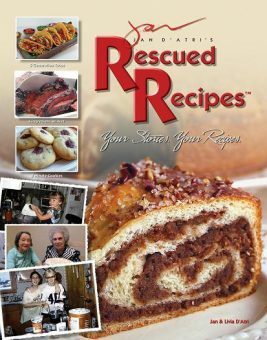 Rescued Recipes Vol. 1 is a culmination of love, joy, tears, memories and pinches of this and that, all blending together into one of the richest tales of family history ever written. This book is a treat for the giver as much as the receiver, you will fall in love with the families who so graciously shared their heritage with us. It’s New, It’s Neat, It’s what you really Need! I love this beautiful combination of spatula and spoon! It was invented out of necessity (as most great tools are) by a wonderful craftsman named Larry Virtue. None of his knives, spoons or spatula’s would get all of the of the peanut butter out of the jar, so he designed one that would! I encouraged Larry to create different sizes for different cooking functions. So now you have three that are curved just the way your jars, bowls and pots are! The Spatuloon is good for meat or marinara sauce because it won’t absorb the red tomato color. It’s good for the planet because, although it’s stronger than many woods, bamboo is a grass that grows quickly and doesn’t require replanting, making it one of the most renewable resources we have. It looks like something your grandma would cook with, right? 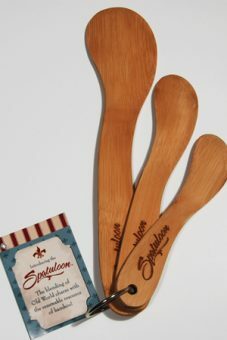 But because the Spatuloon is made of durable natural bamboo, it may be just the heirloom cooking utensil that you’ll pass along to your children and grandchildren. I sure hope so! To help keep your Spatuloon in beautiful working condition, I suggest that you wash by hand.